I did note I had the month wrong in the title nit could not edit it. Perhaps the mods could? The Prince of Wales and Duchess of Cornwall will visit Australia, beginning their engagements in Brisbane on Wednesday 4th April. His Royal Highness, accompanied by The Duchess, will represent Her Majesty The Queen at the opening of the XXI Commonwealth Games, reading out Her Majesty's customary message, calling on athletes to come together in the spirit of friendly competition. Their Royal Highnesses will visit Brisbane & the Gold Coast together; before His Royal Highness continues his visit to Queensland and the Northern Territory, concluding on Tuesday 10th April. 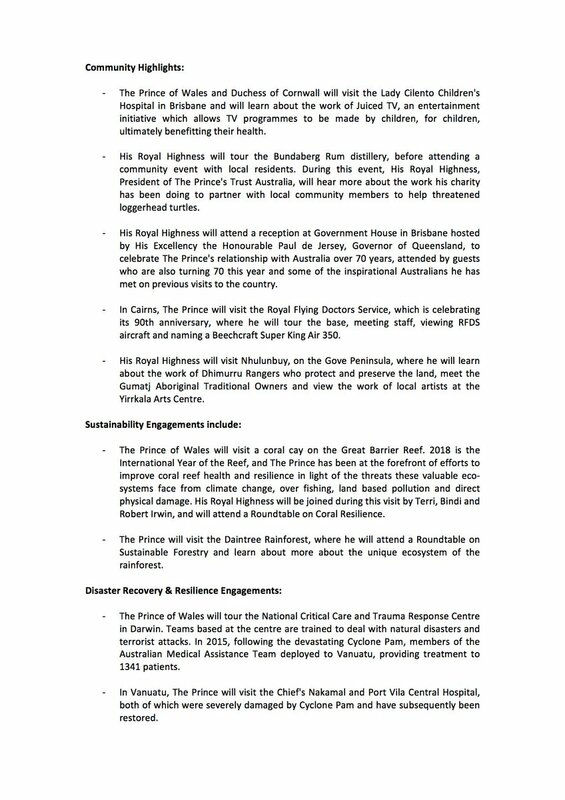 The Prince of Wales will visit Vanuatu on Saturday 7th April, where his programme will include learning more about the reconstruction which has taken place following the devastating impact of Cyclone Pam. Camilla is here for three days and Charles for about a week. Edward will be here for longer arriving the day Charles leaves. Charles will be there 4th-10th April. I don’t think there’s anything going on in the UK he couldn’t miss. CHOGM is 16th -20th April, they would never schedule them at the same time. Charles is hoping to be the future head of the Commonwealth, he’d never miss that. The dinner is usually on the first night and Charles will be back for that. There is no way they would have the Commonwealth Games and CHOGM clash as many of the Commonwealth Heads of Government will want to go to Brisbane to support their athletes. 3 days for such a long trip seems odd, but I am glad Camilla is going, even if for just a few days. I had a bad feeling about this trip when it was announced - nothing specific just a gut feeling. I sincerely hope and pray that I am wrong and all is well. I like them much more than I do the younger, more popular royals. Camilla cutting it short after 3 days sounds logical to me. She'll be there with Charles for the main events yet, knowing how she just doesn't adapt well to hot weather, is bypassing on a more lengthly trip. She may also have other things on her plate she needs to do once she's back in the UK. Let's face it, Camilla has not a strong health and above all she can't stand hot weather. She know her limits very well, and indeed it's quite logical to cut short such a long trip. Aren't Charles and Camilla already on the way to Singapore, enroute for Australia and the Commonwealth Games? Possibly but it doesn't take that long. If they leave later today London time they will be in Brisbane at 6.00 a.m. or so on Wednesday (have take BA many times and the flight leaves around 9.00 p.m. at night and arrives in Sydney/Brisbane about 5.30 - 6.00 a.m. two days later so leave Monday night and arrive Wednesday morning. I would expect them to therefore leave later tonight (Charles certainly as Camilla may have gone ahead to get 'heat adjusted' by staying a few extra days in Singapore). They will then have a few extra hours in Singapore before the RAAF plane brings them the rest of the way. Thank you, Iluvbertie. Yes, I was calculating in two or three days in Singapore, at least for Camilla, before continuing on to Brisbane. 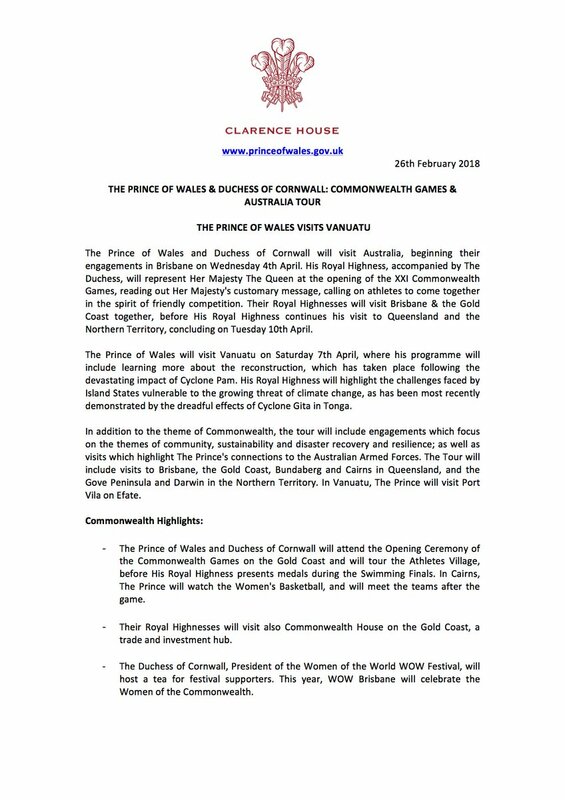 I have seen the CC up to the 1st April and according to it they haven't left the UK and for such a high profile tour - the heir to the throne coming to open the Commonwealth Games - it would be normal for that to be listed. Charles normally doesn't take 'extra days' but flies out, does his thing and flies back asap. Camilla may have already left - we haven't seen her for some time. Her last engagement was 22nd March. They have landed in Brisbane and undertaken the official welcome and walkabout in the Botanic Gardens there.